NEW YORK, NY and MENLO PARK, CA--(Marketwired - Oct 28, 2014) - A new collaboration between nonprofit data analysis firm SumAll.org and Ayasdi, the leading provider of accelerated learning software for complex data, is helping aid organizations analyze and visualize complex data more rapidly, accelerating the development and deployment of life-saving interventions in response to some of the world's toughest health care and social challenges. Using the combined expertise of SumAll.org's multi-disciplinary teams and Ayasdi's core analytics application, aid organizations can uncover never-before-seen trends and potentially unexpected results, without the need to formulate hypotheses or assemble a team of data scientists. Collecting and analyzing data in developing countries and regions of conflict in order to devise feasible solutions to social and health issues is a monumental challenge for humanitarian organizations. The lack of reliable infrastructure, cultural and lifestyle nuances and tensions between conflicting regimes make gathering accurate data extremely difficult, while crunching the numbers to derive actionable insights is overwhelmingly time-consuming and expensive. 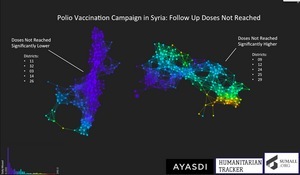 To resolve those challenges, recently SumAll.org and Ayasdi joined forces to analyze the impact of a childhood polio vaccination campaign conducted in Syria -- an active conflict zone encompassing millions of people. In order to be effective, vaccine doses must be administered in a series; however, there was concern that, despite aid workers' best efforts, some children were not receiving the follow-up doses necessary to protect the population from the disease. Identifying locations where this was an issue would enable workers to concentrate their efforts in those areas to ensure that all children received the effective number of doses. Using data provided by Humanitarian Tracker, a 501c3 nonprofit organization that has been crowdsourcing data on the conflict in Syria since March 2011, SumAll.org and Ayasdi conducted a rapid systematic cluster analysis to identify which locations in the region were most affected by "doses not reached" -- children who had received the first, but not the follow-up, dose. The resulting visualization identified specific districts within the region where the "doses not reached" was significantly higher, pointing to the high fluidity of refugee populations at vaccination sites as the likely cause. Based on this information, SumAll.org and Humanitarian Tracker enabled vaccination aid organizations to devise a strategy to more effectively reach this critical population. Conducting this kind of detailed analysis with a conventional spreadsheet approach would have taken days or weeks of tedious examination, looking for outliers, formulating hypotheses and then testing and validation for over 100 districts. But, with Ayasdi's topological data analysis approach and the ability to visualize the data quickly, the team was able to eliminate the cost and time of manual analysis and the process of formulating and testing multiple hypotheses. "With this solution, we can cut to the chase to see what interesting segmentation, trends or correlations the data reveals with the statistical foundation to validate significance," said Stefan Heeke, executive director at SumAll.org. "Ayasdi's core application is incredibly fast, efficient and approachable, allowing aid organizations to spend more time, money and effort developing and implementing solutions. We suspect there are many organizations sitting on reams of data they really don't know what do with. This solution could be the key to unlocking incredible insight that's been hiding right under their noses." Particularly in the health care and epidemiology fields, response time is critical. This ability to rapidly extract insights from complex data sets can empower organizations to be more responsive, particularly in crisis applications, such as trending analysis on the spread of polio, Ebola, malaria, and perhaps even new threats, like the Human Enterovirus 68 respiratory virus that's hospitalized children in 10 states across the U.S.
"Ayasdi is committed to transforming how the world uses data to solve complex problems, and SumAll.org is an ideal collaborator to positively and rapidly impact lives around the world," said Gurjeet Singh, CEO at Ayasdi. "Working with the SumAll.org team makes us think that there is no problem that cannot be solved." To read the complete Syrian polio vaccination campaign analysis case study, click here. To learn more about nonprofit data analysis collaboration, or to discuss a potential analysis project with your health care, social or other civic data sets, visit www.SumAll.org. SumAll.org is a (big) data and impact analytics nonprofit organization that builds on SumAll.com financial support, startup ecosystem and engineering power while expanding the talent pool, partnerships and toolset to meet the specific challenges related to civic data projects. Its multi-disciplinary team uses the power of data for social innovation, to create tangible, real-world impact through outcome-oriented civic data analytics including Social Service Targeting, Impact Measurement and Investigative Analytics. SumAll.org is supported by 10 percent equity of SumAll.com, with the goal of translating the company's philosophy and applying its technology for tangible social impact. SumAll.org and SumAll.com are headquartered in New York City. Ayasdi is transforming how the world uses data to solve complex problems by automatically discovering and operationalizing insights from complex datasets. Founded in 2008 after a decade of DARPA and NSF funded research at Stanford, Ayasdi's has been named as one of the most innovative companies in big data by Fortune, Fast Company and others. The company's advanced analytics solution combines machine learning with Topological Data Analysis (TDA), enabling users to extract subtle, often hidden insights from their data. Funded by Khosla Ventures, Institutional Venture Partners, GE Ventures, Citi Ventures, and FLOODGATE, Ayasdi's customers include General Electric, Citigroup, Anadarko, Boehringer Ingelheim, the University of California San Francisco (UCSF), Mercy, and Mount Sinai Hospital. To learn more, visit www.ayasdi.com or follow us @ayasdi. Ayasdi helps the world's biggest and most sophisticated organizations discover breakthroughs that change how we all live and work. People who share this passion can view Ayasdi career opportunities here. The collaboration rapidly identified the districts at most risk of not reaching follow up doses, helping aid organizations apply life-saving resources.